The summer sun pushes the temperature relentlessly higher and the humidity weighs heavy. What do you do to cool off? If you live in Greece, you will probably reach for a frappé. Fifty years ago, Dimitris Vakondios casually invented the Greek frappé when he mixed instant coffee with sugar and cold water in a shaker bottle. This refreshing, iced coffee topped with a generous layer of foam quickly became popular and the recipe evolved to include evaporated milk, icecream and even liquors. The frappé continues to be a summer-time favorite in Greece and surrounding countries. Thanks to The Coffee Connection, a chain of coffee shops in Massachusetts, the frappé morphed into the frappuccino that we know and love today. The Coffee Connection’s early frappuccinos were coffee, milk and sugar blended with ice until creamy. Simple, yet overwhelming successful, frappuccinos doubled the Coffee Connection’s sales and caught the attention of another coffeehouse chain: Starbucks. In the mid-1990s, Starbucks bought The Coffee Connections and the rights to the frappuccino name. Since then, frappuccinos have consistently expanded in popularity and diversity. Starbucks’ frappuccinos can be personalized in a variety of ways and if you make your own homemade version, there are even more delicious options. Frappuccinos have four basic components. Understanding these components will enable you to modify them to satisfy every craving. Frappuccinos fall into two types: coffee based or crème based. Coffee-based frappuccinos were originally made with instant coffee, but today Starbucks uses its own frappuccino roast which provides a strong coffee flavor. This frap roast can be exchanged for espresso if you want more flavor and caffeine or it can be substituted by decaffeinated espresso for those who don’t need an energy boost. Professional baristas use whole milk in all their frappuccinos, because it contributes to the overall creaminess. However, clients can request skim milk or even a milk alternative, such as vanilla-flavored soy milk. These alternate milks result in a thinner frappuccino, but they also contain fewer calories and fats. In 2006, Starbucks released a number of Juice Blend Frappuccinos. These summer-time frappuccinos included fruit purees, juices and teas instead of milk. These varieties eventually disappeared from the menu, but a combination of fruit juices or your favorite tea is still a tasty option for homemade frappuccinos. In all of its coffee-based frappuccinos, Starbucks includes a flavor-less syrup that increases sweetness and thickness without interfering with the coffee flavor. You can enjoy your coffee frappuccino with only this syrup or request additional flavorings, such as caramel, cinnamon or white chocolate syrup, mocha sauce, or even java chips and vanilla bean powder. Crème-based frappuccino come with even more flavorings to choose from. How about a single flavor, for instance strawberry or smoked butterscotch? Or do you prefer a combination? Popular combinations include mocha sauce and chocolate chips for chocoholics, vanilla bean and raspberry, mocha sauce and peppermint or even Chai tea with cinnamon for the health-conscious. A variety of Starbucks’ flavoring syrups can be purchased and used at home. You can also be creative and invent your own. I will mention peanut butter sauce and hot fudge icecream syrup just to trigger your imagination. Jelly is also a valid option. 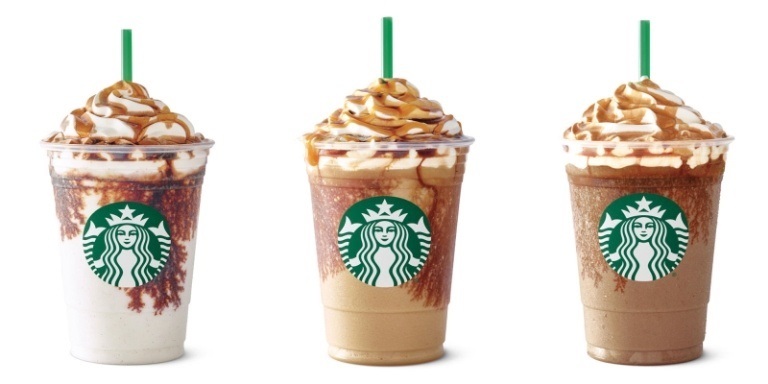 Last year Starbucks released the Coffee Jelly Frappuccino in Japan. This innovative frappuccino sports a layer of coffee-flavored jelly at the bottom of the cup and considering its ongoing success, I wouldn’t be surprised if other jelly frappuccinos entered the market. The coffee or crème base, with the milk or its alternative, as well as the syrups, sauces and powders added for flavor are mixed together with ice to make the body of the frappuccino. Back in the early days, frappuccinos were served just like that, but today we add whipped cream and one or two toppings as a final touch. Whipped cream with a drop of vanilla complements any frappuccino, while whipped cream flavored with citrus zest, cocoa powder or almond extract could add a gourmet touch. Once you have your whipped cream on top, gently drizzle on a little caramel or mocha sauce and add a sprinkle of chocolate shavings, cookie crumbs, chopped nuts or nutmeg and other spices. 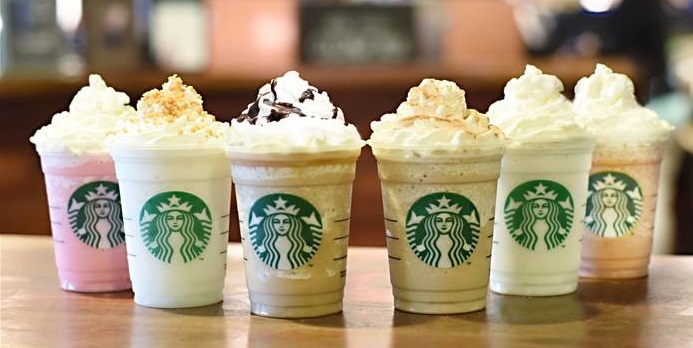 Considering that frappuccinos have four basic components and each one has a number of variables, we can calculate that there are more than five thousand different types frappuccinos. That is more that five thousand different ways to refresh yourself at your favorite coffeehouse or in your own kitchen.